When I was growing up, my closest sibling to me was my brother that is 2 years older than me. By the time I hit Jr. High all of my other siblings were out of the house (I was the youngest of 9) and because of that, I spent most of my time with my brother. I loved playing games and because I was the younger sister, I had to do things that he wanted to do. And because of that I learned to love superheroes. I remember growing up and for Halloween I would go as a superhero more often than another kind of costume. I just loved them. And of course I still love them! And since I have 4 boys and just 1 girl, our family loves superheroes too, especially The Avengers. We were all so excited about the new movie, MARVEL’s The Avengers: Age of Ultron, coming out last week. 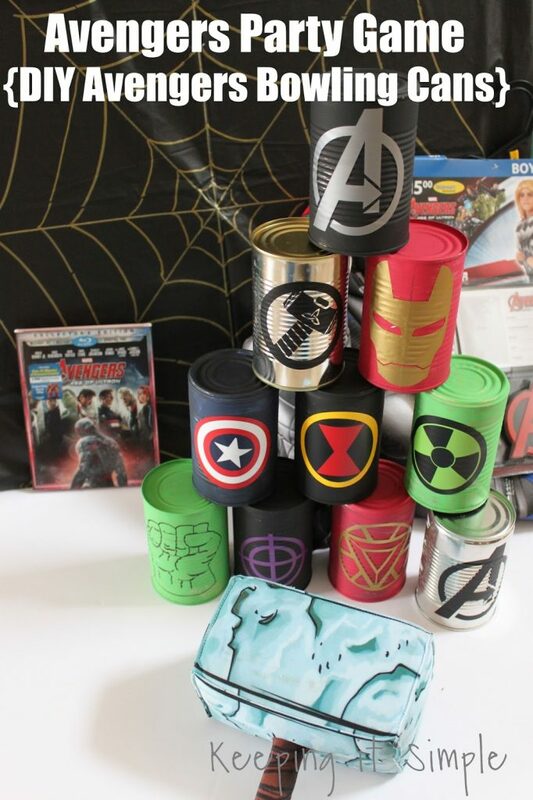 To get more excited and ready for it, I decided to pick up some costumes and make a fun Avengers party game for us to play before and after watching the movie! These bowling cans are a huge hit with my kids. They are so easy to make and they are so much fun to play. My kids will play for hours if I let them! I took regular food cans, removed the labels and washed them. For the Hulk, Black Widow and Captain American, I had to cut out several different colors of vinyl. Before I put them onto the cans I layered the vinyl together to make their symbols. For Thor and The Avengers symbol, I just used the silver can. I put the vinyl onto the can using transfer paper. For Hawkeye, Black Widow and the other symbol, I painted the cans black first and then put on the vinyl. For Iron Man and Captain American, I painted the cans red and blue. And for the Hulk, I painted the cans green. For his hand I decided just to take a marker to it and draw it on (it was easier than trying to cut it out with vinyl). And that’s it for the cans!! All you have to do is set them up and then throw something at them to knock them down! The metal food cans work the best because they with stand all the throwing and getting knocked over. I found some sweet costumes at Walmart. They have a great selection of MARVEL costumes and they are great prices too. I found the costumes in the Halloween section. And of course I had to pick up the new movie: MARVEL’s The Avengers: Age of Ultron. I found the movie in the back of the store by electronics. Here is my oldest as Thor, he’s excited to watch the movie and play the game. And here is Captain America and Iron Man, all ready to go :). Since several of The Avengers throw things (or shoot things) I thought it would be fun for the boys to knock the cans down with their character’s weapons. Thor threw the hammer, Captain America threw the shield, Hawkeye could shoot a bow and arrow and so forth. Here’s a fun video to show you how fun this game is! And afterwards, they all stayed in costume and enjoyed watching the awesome movie! Make sure to check out all the new MARVEL costumes at Walmart, and while you’re there, pick up the movie too. Are any of your kids going to be The Avengers this year? If so, let me know, I would love to hear! Your boys are the cutest!!! Love Captain America…he truly embodies the character!!! I love this! My kids are going to think I'm the best mom ever if I recreate these! Such a fun game! 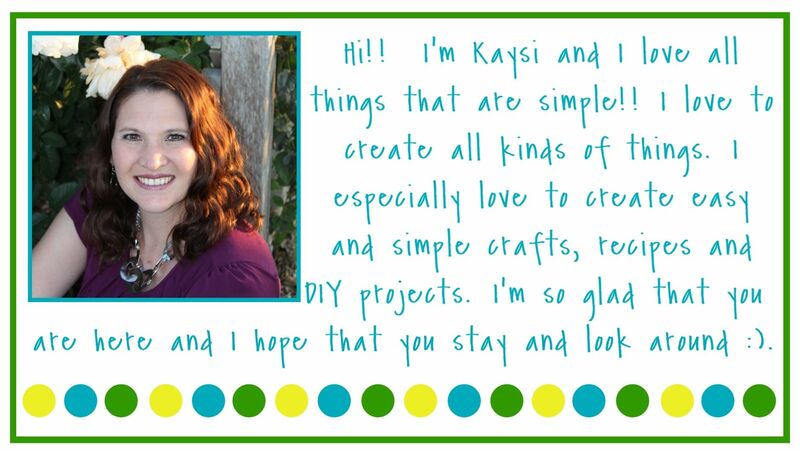 I am featuring this on simplycreativemoms.com if you don't mind.